Shower pan with 3/4" beveled threshold and end drain. Pre-Leveled, No mud setting required. 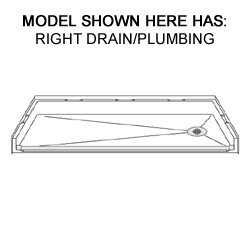 Best Bath Systems One piece 60” x 32” shower pan with 3/4” low beveled entry and end drain designed to fit seamlessly into your Barrier Free walk-in shower. The durable polyester gelcoat finish surface is very easy to clean. Exceptionally strong, pre-leveled at the factory and requires no mud setting. 30 year limited warranty. Made in America. W x D x H (Outside Dimensions): 60" x 32" x 4-3/4"
Optional Accessories: Caukless Brass Shower Drain & Rubber WaterStopper Kit, see below. LEAD TIMES: NEED IT NOW Pan Packages (WHITE Shower Pan with WaterStopper & No-Caulk Drain) ship within 24 business hours of order processing. White, Biscuit, Almond, Bone and Ice Grey Pans ship within 3 business days of order processing. Please call for lead time on multiple units. This item is delivered via Freight. Additional freight fees may apply based on delivery arrangement needs. Adaptive Living, Inc. Policies | Partner Programs | Contact Adaptive Living, Inc.